I've had a wonderful terrible idea. 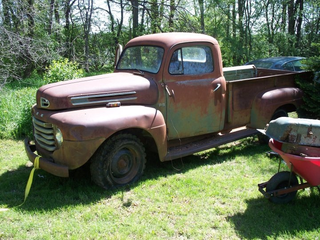 The ‘48 - ‘50 Ford truck has been my dream truck for a long time. I’m lucky enough to own two (even though I don’t have a great place to build one yet), but lately I’ve been facing a dilemma. See, I’m having a child sometime within the next two weeks, and while building my 1950 F3 is my dream, another dream just as important to me is to be able to share these things with my kid. Now, it will be several years at a minimum before I even think about putting a small child into an old vehicle like this, but even when they’re old enough, a regular cab truck (and a small cab at that) really limits what I’ll be able to do with my kids, especially if I have more than one and want to bring the wife with as well. So lately I’ve been contemplating selling/trading them off for a newer, but still cool, extended cab or crew cab truck, Bronco/Blazer/Scout etc, or even possibly a fun car, even though I’d prefer a truck. As I was scrolling through CL looking for potential options however, a thought hit me. It’s gonna be a quite while before I can bring my kid with me anyway, ideally long enough to at least build a running/driving truck, so why worry about replacing it now? This leads us down the rabbit hole I’m currently in. If I don’t need to replace it now, then I’ll still have time to build it, but I still run into the problem of it being a single cab, so buy a crew cab later? Keep this truck and buy a crew cab? But wait! I already have two trucks..... why not..... build a crew cab?! I know this is going to be an insane amount of work, but I’m an engineer, how hard can it be? (Famous last words) I’m sure I can figure it out. This way I get everything I want, my dream truck that I can still share with my kids, and do family activities in. It’s been done before, but not quite exactly how I’d do it, the picture below is pretty close though, I’d just keep mine 2wd, in a more traditional hot rod style, and keep the running boards. Feel free to weigh in with how crazy you think this is, but keep in mine I won’t be online this weekend most likely so there will be plenty of time for this idea to permanently embed itself into my brain.